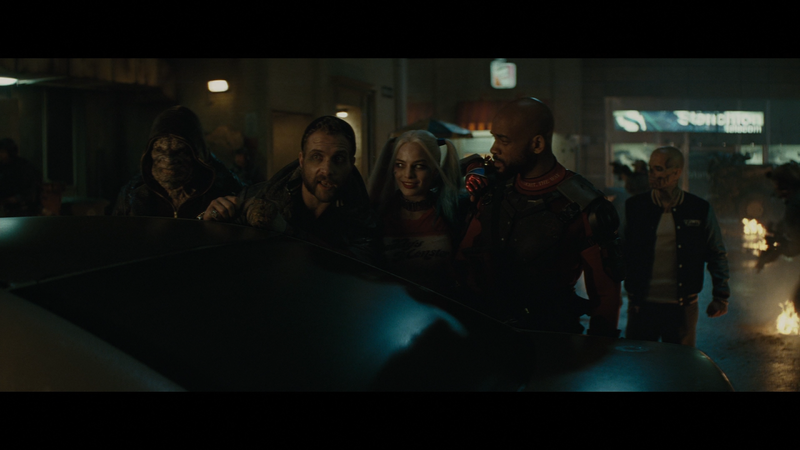 Does the Suicide Squad get redeemed by an extended version or is it just more of the same? 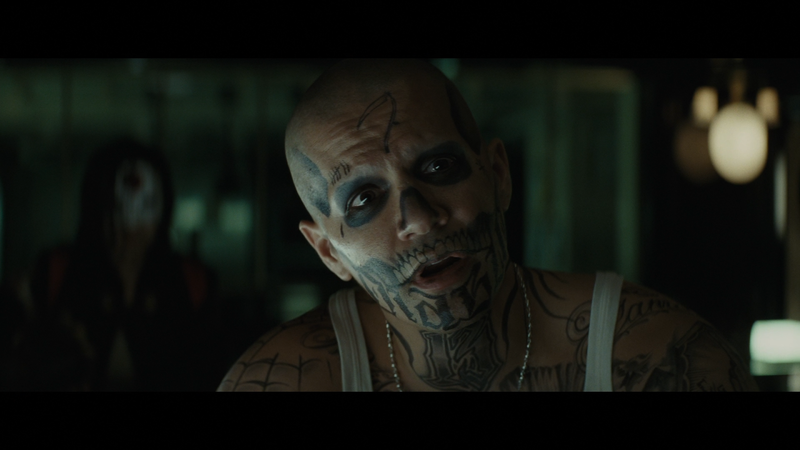 Director David Ayer wanted the film to be in as much reality as he could. The tattoos (which the main characters got from Margot Robbie), the military training (boot camp style), and the environments are all discussed. 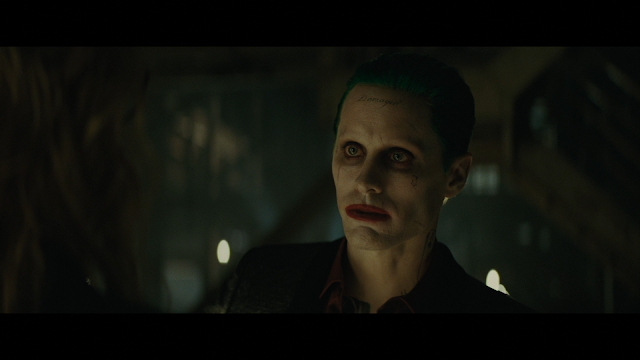 Jared Leto discusses the process that he went through to find his version of the Joker and the cast and crew’s reaction to it. The look and the wardrobe are explored. 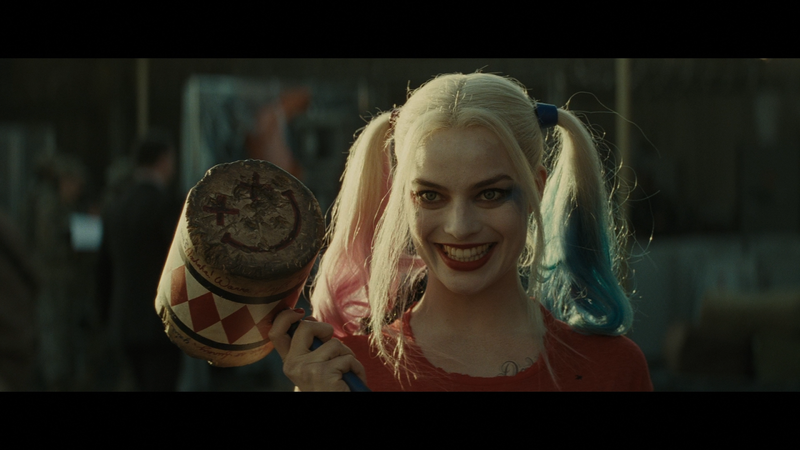 We also get more info of Harley Quinn. Lots of behind the scenes of Leto as Joker. Hunter (1993) and Mr. Nice Guy (1997). We also learn about the training that the actors had to go through in order for them to be able to do most of the fighting and stunt work themselves. 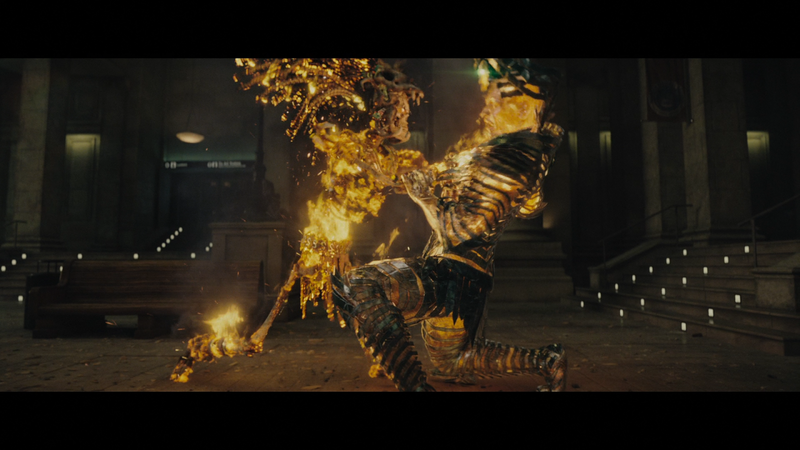 All different types of techniques (wire work, stunt work) were used to stage the fight scenes and shoot outs. Most of this was done practically, which is a nice change of pace from all the other action films made today. In fact, they used blanks which results in muzzle flashes coming from the guns. 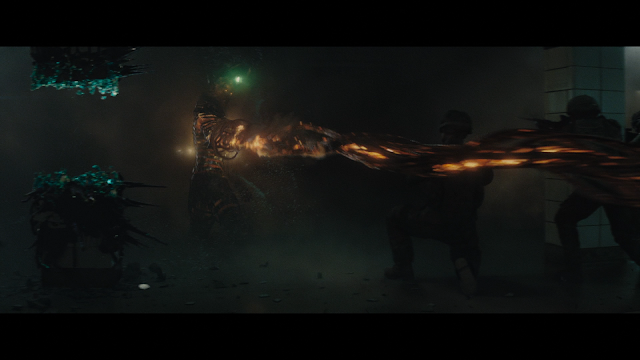 This is really nice to see as most action films use CGI for the muzzle flash. 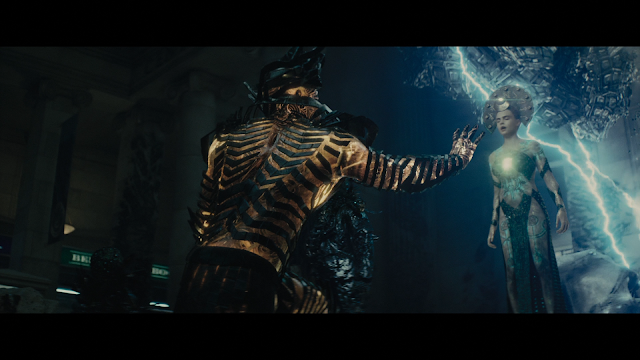 There is also talk about the CGI used in the climax of the film, but it is barely touched on. This is a rundown of the shootout between the Squad and the eyeball things. It is broken down into small chunks. I felt that this was aimed more at kids than anything else just by the way it is presented. 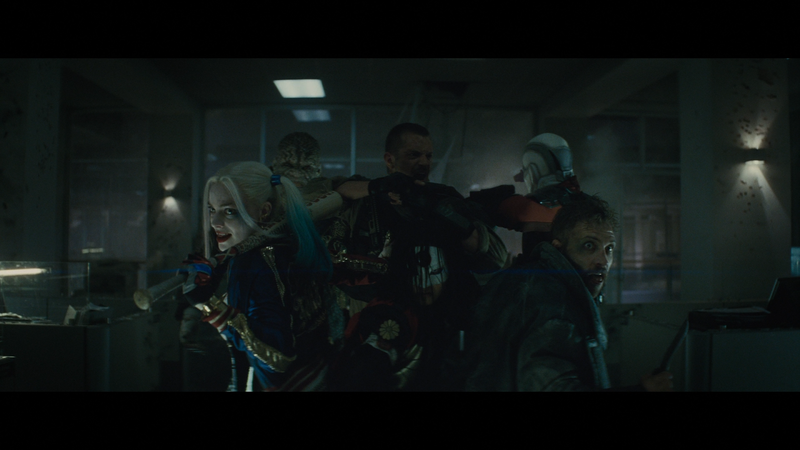 Line flubbing, tripping over things, and sneezing are all in a day’s work on the Suicide Squad set. We get a 4K promo, the Batman v Superman trailer that we have all seen a thousand times, and the first Wonder Woman trailer. 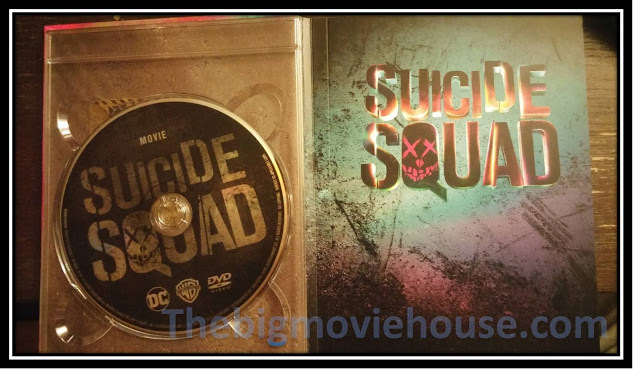 All of the special features from the Extended Cut disc are replicated on this disc. Disc #3: DVD version of the theatrical version. Also included is a code for a digital copy of the film. 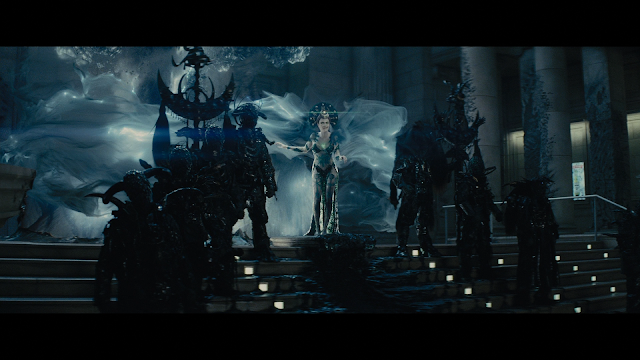 Warner Brothers has given each of the major chains their own package. Walmart has a two film set with this film and the animated Assault on Arkham. Best Buy has a steelbook that contains the 4K blu-ray, and regular blu-ray. Target got a digibook. That is the version I am talking about here. 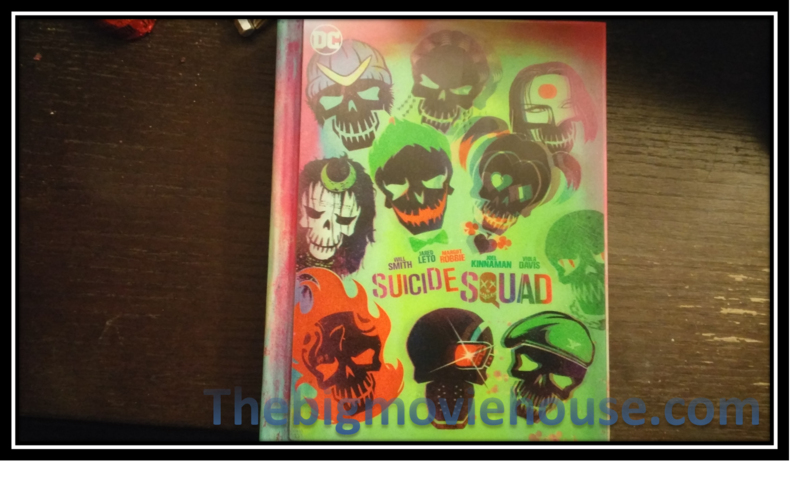 The front of the digibook has the neon lights symbols for each of the characters instead of the actors looking up at us. The cover is also lenticular which means that it gives a 3D effect when you move it from side to side. 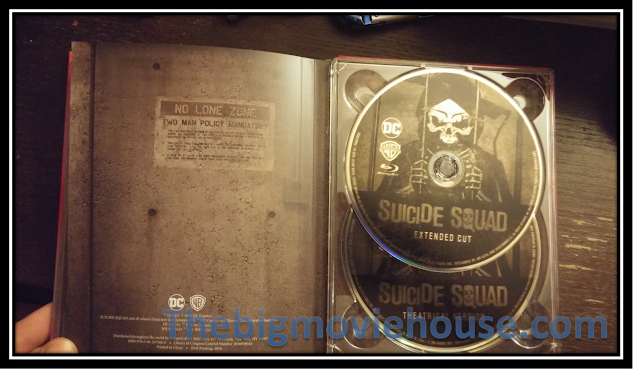 Inside is a 64 page excerpt from the official Suicide Squad book. All of the pages are a nice photo stock which every two pages covering a different character (including Slipknot) The last page of the digibook is an advertisement for the book the photos came from. The discs are housed on the inside of the front and back cover. The front holds one disc while the back holds two discs. The two blu-rays have the exact same disc art and are only differentiated by what cut is on the disc, Extended for one, theatrical for the other. The dvd has the title of the film as it’s disc art. The disc art for all the discs is the usual Warner Bros black and disc coloring. All three of the discs are REGION FREE. 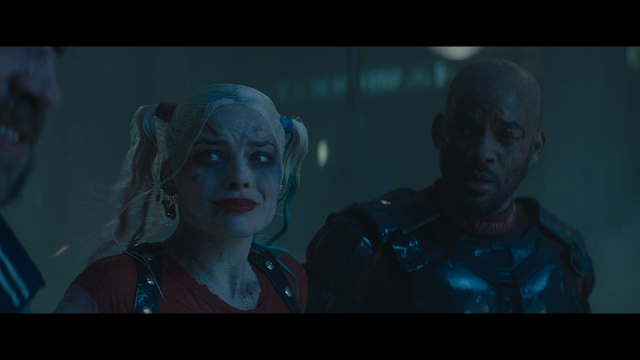 Warner Brothers has given Suicide Squad a great transfer. Of course, this is new film so the transfer should be great, but there have been newer films where the transfer is messed up somehow. 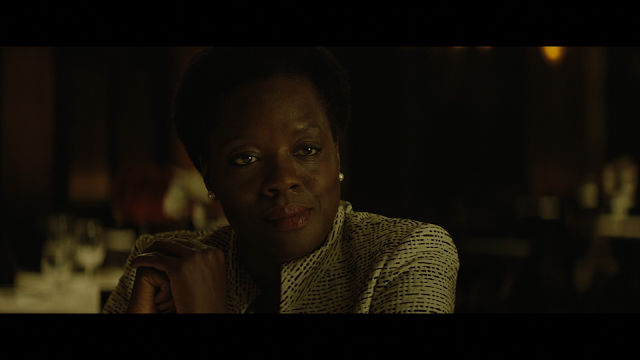 The film mostly takes place at night and/ in the darkness and the transfer handles the blacks very nicely. This also allows the colors to stand out more. The yellow and orange of Diablo’s flames pops out from the background as do most of the other bright colors. Warner Brothers has knocked it out of the park with this one. Note: Given that both cuts get their own disc, the encodes are allowed to breathe more than if they were both placed on the same disc. As I don’t have a Dolby Atmos decoder, I am reviewing the Dolby TrueHD 7.1 track and I was happy with what I heard. 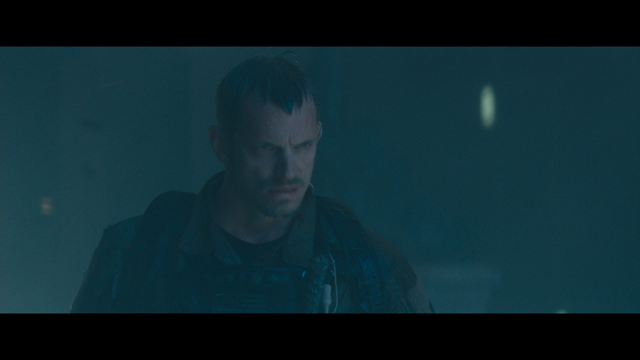 The gunfire, explosions, and effects give each channel a workout and the music (both the score and the pop music) are clear precise. The only problem that I encountered was some of the dialogue fell off a bit during the action scenes. This is not a big gripe, but it is something that I noticed. Other than that, this is a great track that can be used to demo your surround sound. HERE is my original review for the film. As for the Extended Cut, I thought that the additions were nothing special. Sure, we get some extra added character beats, but nothing really stands out as needing to be added back in. 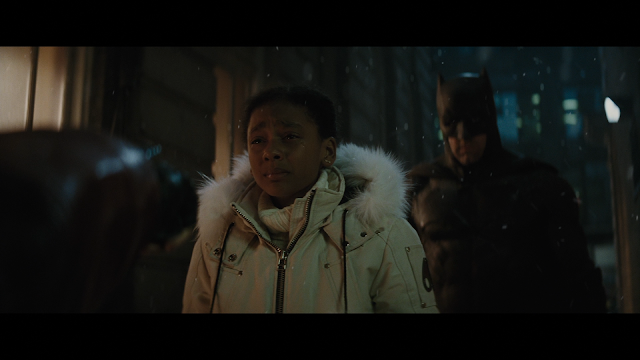 This is not a Batman v Superman type extension where there were things taken out that were needed to make the film cohesive. This Extended Edition is just that: extended. Now if they had gone back and recut the film to make it better, then I would have been all over this version, but they didn't. They made the film longer, nothing more. Suicide Squad is a mixed bag. It is really nice to see these characters on the big screen, but the story is a mess. 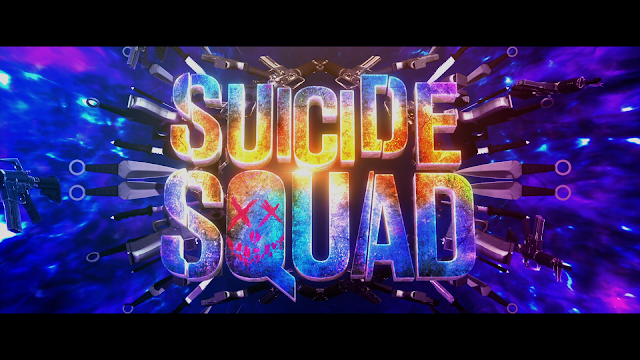 I wish that Warner Brothers and DC would have given David Ayer more than six weeks to write the script as this could have been a really unique film. 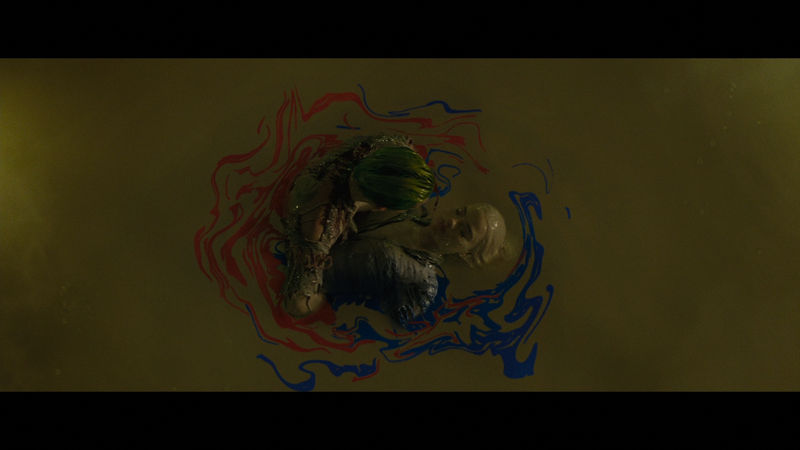 Leto Joker is a joke (pun not intended) If you watch the behind the scenes footage of him as the Joker, it is clear that he didn’t really know what he was doing. 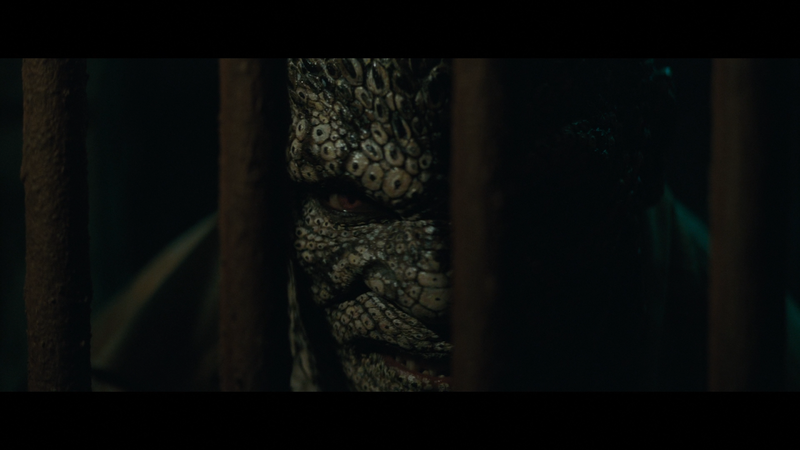 The film is a mess, but there are some positives to take away from it. 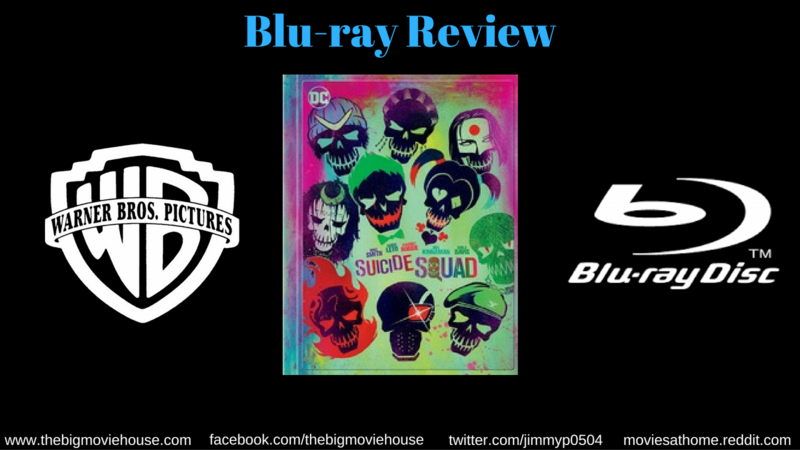 The blu-ray that Warner Brothers has released is nice, but I wish that they had done more. It is clear that all they want to do is make money and you can tell from this release. 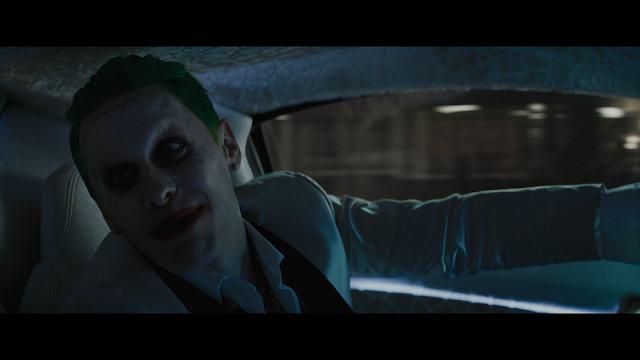 They do give us great picture and sound, but the features are almost as much of a joke as Leto’s Joker. Most of these features come off as glorified EPKs and there isn’t much to be learned about this film. I learned a few things, Richard Norton working on the film and that most of the action is filmed practically, but that is about it. I wanted more in the features department and they failed me. 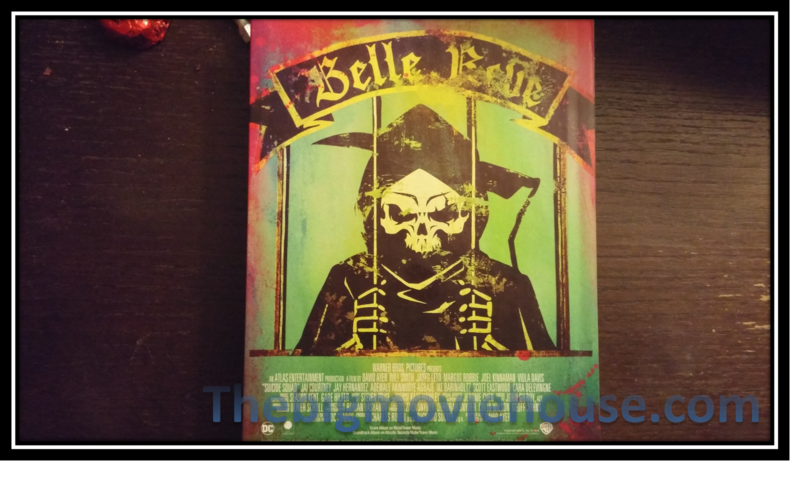 The digibook is nice, but I can’t really say that it is worth the extra money. If you can find it cheap then buy it, otherwise just get the regular edition when the price drops. CHECK OUT PAGE 2 FOR MORE SCREENSHOTS. THEY MAY CONTAIN SPOILERS!